AE: Star Leaf marks your first feature film return to the science-fiction genre since the conclusion of the Gene Roddenberry series Earth: The Final Conflict in 2001. As a producer and actor in this new extra-terrestrial, comedy-thriller, what made this project intriguing to work on for you personally? Leeshock: Well, going in I thought we were making a good old, funny, goofy, horror flick; and we have one major star in our movie, which is the marijuana plant. When we set out to make the film, it seemed a little too serious, [but] I decided to defer to Rich, [particularly in regards to] the Iraq War veteran angle of the story. So I conceded a lot of control to Cranor, and in short, the whole process taught [Cranor and myself] to have faith in the power of the subconscious mind and to figure out the details later on. AE: A large part of the film’s rhetorical impetus has to do with the legalization of medical marijuana. In regards to your work and partnership with cannabis manufacturers and distributors like Ohana Farms and Analytical 360 of the state of Washington, where you and Cranor filmed his latest production, how do you feel about the current legal strictures against the use of pot in the United States, recreationally and medicinally? Leeshock: Well, I like to drink. And I drink, well, I don’t know…I drink excessively. And I don’t know why I drink, but I’m 53, [and] I guess it seems to me that the marijuana issue has been so politicized, I guess because of the ramifications of hemp and hemp-related products. The suppression of all the medical benefits and how much we allow the recreational side to proliferate is complicated, but if every state followed the examples set by Colorado, that this plant is spiritual to people. So, I’m learning as I go, but the ramifications of what this plant means to so many different people is really astounding. There’s a force… a power that allows you to see the unseeable. AE: In writing the film, director Richard Cranor was directly inspired by the experiences of PTSD suffered by his brother after returning from military service overseas in the Iraq War, in addition to his own battle with cancer. 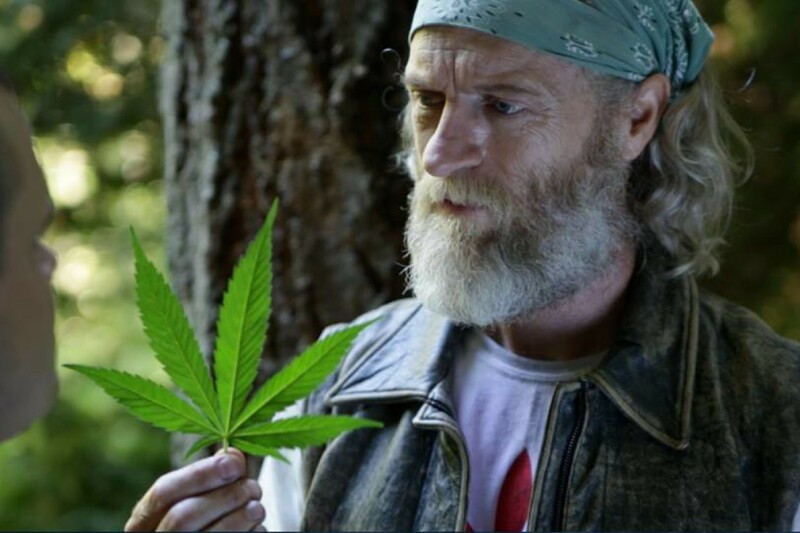 Cranor has talked at length about cannabis’ ability to allow PTSD sufferers to “Bypass the conscious mind and get to the root of painful memories faster than traditional therapy,” and grants users back their own “soverignity.” Would you care to comment on Cranor’s philosophy, and how it has affected your own belief systems in the making of the film? Leeshock: I think that quote comes from something Dr. Judy Peters said, a medical scientist who uses cannabis for veterans with PTSD [and] allows them to smoke the cannabis [in order for the] unconscious to be tapped. [In her work, Peters] uses a brain mapping technique and gets neurological feedback. Even just reading her material, there’s a calming effect [that Cranor and I have followed in the making of the film]. AE: Would you say that your film is a comedy first, a la Cheech and Chong, or a more of a genre thriller with some stoner elements strewn throughout? Leeshock: I’ll be at one screening where it will be dead quiet and serious, and then I’ll be at another with stoners cackling. You can not pin the movie down. If you go in with a certain mood, you’ll experience a certain apect of it. What I like about the movie is that it’s really weird and trippy. AE: What’s been the general reception to your new film as you’ve experienced it? Has it played well to American audiences, or has reception in any particular overseas territory been stronger? Leeshock: [We’ve been screening the film] mainly in the U.S. If we take it to a hemp con, we’re the bells of the ball. But there was a Vietnam vet in Colorado who walked out. I’m still wondering what this movie means to people. I mean, we’ve gotten reviews, maybe twenty times, and I would say sixteen out of twenty are positive, two to three are mediocre, and one just slams it. But if you were say to me is it funny? Yeah. Is it trippy. Yeah! AE: Prior to filming Star Leaf, you also worked with Cranor on his 2012 short film GodMachine, another sci-fi genre picture about a computer virus that lends an android the power to channel the frequency of the Big Bang. How have you enjoyed working with Cranor, as opposed to Roddenberry and others? Would you accept another role in a genre film with Cranor? Leeshock: The road with Cranor has been a rich and bumpy ride. I battled with Rich endlessly on GodMachine. I felt like he was doing some auteur meandering into his subconscious, like David Lynch. There’s part of me that, because I’ve realized that producing is so difficult, that I would welcome, with open arms, the Roddenberry camp, but what I like about Cranor is that he’s challenged the status quo. I think Rich is a little…I call Rich an intellectual badass. He’s subversive. [Roddenberry and Cranor] both possess a unifying force where they will bring in different themes that will appeal to different people that are bubbling under the collective unconscious. AE: In addition to your work as a screen actor, you have penned an original screenplay, Yo Yo Boy from 2002, in addition to creating original characters for stand-up venues in New York and Los Angeles, and have worked as a professional photographer in a former studio in New York in the production of projects for both film and TV. Is there any aspect of the entertainment industry that you would still like a chance to explore? Do you have any interest in directing? Leeshock: I wish I would have asked Rich for a director’s credit on Star Leaf. I think I have a knack for directing actors. If I could find someone with the DP skills, I’d like to direct a real actor’s piece. I’m pretty happy with the acting in Star Leaf, and I’d like to take a little bit of credit, even when Rich would get pissed off. I remember on GodMachine he never gave me one. AE: As a life long actor, photographer, and producer in the entertainment industry, what advice would have to give to anyone who might just be starting out as an actor, screenwriter, or director? How has the industry changed since you started back in the late 1980s? Leeshock: Well, I guess anybody can create content, because the price of equipment has come down so incredibly, which then means part of the creative process comes in how you differentiate yourself from the rest of the herd. I think we did that [with Star Leaf] because we had the merchandising side of it, [on the part of partners like Ohana Farms, Analytical 360, and Cannarignals]. I don’t think I would have made the film without the merchandising strategy. AE: Growing up, what actors and filmmakers inspired you the most as a professional? What films captured your imagination personally? Leeshock: I’m a big of fan of Coppola and The Godfather, and growing up I just loved Steve McQueen, and I am inspired by the boldness of Tarantino, and the Coen Brothers. And from an actor’s standpoint, Gary Oldman and the weirdness of Christopher Walken. AE: If there is one actor or director that you would still like to work with, who would they be, and what do you think you might still be able to learn from them and others about your well earned and practiced craft within the entertainment industry? Leeshock: As corny as this sounds, I’d like to work with Spielberg. I’m sure conversations with him about storytelling are just amazing. Or Apatow, because I have some comedic juice in me that I’d like to see tapped. Star Leaf is currently screening in select theaters across the U.S.
NextAre We Too Hard On Young Adult Adventure Films?